Last Saturday, I listened as esteemed Greek-American Charles Kapetanakis dialed into Aktina-FM to rally support for one of the organizations he chairs - Greeks for McCain. During the hour-long conversation, it became painfully clear that although Mr. Kapetanakis approached the broadcast with good intentions, he failed to bring with him little more than a few key messages available on the Arizona senator's website. When it comes to an organization entitled "Greek for McCain," one would think that the chairperson would know or at least be able to refer to the candidates position on matters of importance to the Greek community. Would a group of Jewish faithful lobbying for a candidate not know his/her position on Israel? No, that would be considered an insult to collective intelligence. The only "key message" he repeated was that McCain stood for a strong war on terror (and that he was appreciate of the use of bases in Crete to fight that war) and for a strong NATO. And this is what is supposed to sway my Greek-American vote? Gimme a break! As it turns out the show's host could shed a little light, which did not reflect well on the "heroic" candidate. It turns out that Senator McCain has not actively supported a single resolution proposed in Congress on behalf of issues important to many Greek-Americans. His only action on was to sign a single letter delivered to the President's cabinet. He's been in Congress since 1982! And before you point to a recent meeting the candidate had with leaders of the Orthodox church, know that days following this meeting McCain failed to lend his support to the same issues that had been discussed. For any and every time, we've heard or uttered admiration for the Jews for sticking up for issues important to Israel, NOW is the time to show our strength for Greece. Knowing that U.S. presidential elections can easily be decided by a few hundred votes in a few key states, now is the time to rally and to finally walk the walk we've been talking about for so long. There are 3 million of us across the States who are able to impact this election in a way that is meaningful for the topics we hold dear. Fellow Greeks in Ohio, Florida, Pennsylvania, California, Colorado and Connecticut.. are you listening? Let's get out there and make some noise! I listened to the radio show on Aktina FM and as a Greek American I was embarrassed at the comments from the callers. Sometimes it is hard for us as Greeks to look at ourselves in the mirror, but if we do, we will see that much of our lack of success in foreign affairs lies with ourselves, rather than with US leaders. I say this because the radio show was as much an opportunity for Americans to hear our position and what we had to say, as it was an opportunity to hear about the candidates. Instead of hearing intelligent callers voicing their concerns, the show was flooded with callers accusing McCain of being a "capitalist" (DUH! aren't we all? ), blaming HIM for Bush's policies, and talking about actions that occurred years ago. We are so busy being Democrats, that we FAILED to keep EITHER PARTY ACCOUNTABLE TO OUR CONCERNS. McCain is no Bush, and Obama is no Clinton. It is easy to fall into the trap that the liberal DNC net has cast, that of grouping ALL Republicans under the same net, and then offering phony refuge under a Democratic one. We can't forget (can we?) that when 80+ Orthodox Churches were bombed in the Balkans. . . . with no pause even for Orthodox Christian Easter, we were NOT under a Republican regime. In fact, the same advisors (i.e. Richard Holbrooke, et al) are expected to play a role under the Obama adminstration. In other words, more of the same. ARE WE NAIVE???????????? If you take a closer look at who Obama is, you too will find yourselves disappointed to find an empty suit staring back at you. We have to be very careful of empty suits bearing gifts. Remember Carter, who courted the Greek vote, and then tossed the insignificant Hellenes under the bus? The Obama camp is very versed in Chicago style politics, and they have used their ugly tactics to steal the nomination from Hillary Clinton. Obama has flip flopped on more issues than anyone can count. His track record of relating to and associating with radicals is enough to make one lose sleep at night. I personally have no trust in Obama, nor his empty promises. He has proven to be a political and even a religious opportunist. I am not willing to throw the future of America under the bus, for a fake promise to me as a Greek American. McCain represents a fresh start. He has taken on the Republicans himself, and is not afraid to do so again. HE CAME TO US AND TO THE GREEK ORTHODOX ARCHDIOCESE because he wanted to engage us in his campaign. We should have taken him up on the opportunity to engage in an INTELLIGENT dialoge, especially when we consider that we are only 2+ million of all Americans. Instead, a FOREIGN JOURNALIST verbally attacked him in response. WE CANNOT ACT LIKE BRUTES UNWILLING TO ENGAGE IN A DIALOGUE. Not if we want a seat at the table. It is time to look past party lines and work as SOPHISTICATED GREEK AMERICANS TO FIND SOLUTIONS TO THE PROBLEMS FACING GREEK AMERICANS. It is also time for Greeks in Greece to elect leaders in Greece that are capable of protecting Greek interests, and not just sellouts that just look to line their pockets. As a young Greek American, I am a Democrat voting for McCain. I have heard the tales from my parents, and I know my history. I also know that parties change, and that at the end of the day, CHARACTER of person, is more important that FAKE PROMISES and party affiliation. I am voting for McCain because I trust his commitment to supporting democratic and Christian nations like Greece. I believe McCain will win and encourage the intelligent Greek Americans to get ready to engage the new administration to work towards solutions to the problems facing Greek Americans. I AM ALSO A PROUD AMERICAN WHO BELIEVES THAT A VOTE FOR OBAMA IS A VOTE AGAINST AMERICA; it is no surprise that Obama's biggest supporters are American's biggest enemies. The land that gave my parents a home when they needed one most IS NOT FOR SALE. NO WAY, NO HOW, NOBAMA! Greek Americans should wake up and smell the kafe, the briki is overflowing. . . . . I am gearing up to serve the first cup to McCain. I applaud and thank you for the discourse, because it highlights an important missing piece in the political discussion. Similarly, I also get frustrated that some of the callers do not make their arguments in a PC or elonquent way, but every voice deserves to be heard. That is the beauty of the system. I also fully support your point that we are the most to blame for our lack of success at getting what we, Greek-Americans, want out of the U.S. government. I know we famously hold the Jewish community up as a beacon for lobbying and unity efforts. In that case, it is important to understand one staggering reality of success - unanimous support for ideals in support of a nation abroad. No politician would ever imagine wavering on a stand next to Israel, and the nationwide population is not as large as that support would have you believe. I know it's popular and patriotic to say that we are here now and must vote for what is best, and I agree. But if you consider GREEK issues important, it is important that you know where the candidates stand. How you choose to vote is the freedom you have, but know. McCain met with the Church, and did diddly squat about it. 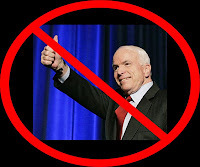 McCain has experience in Congress, but rarely supports us. If he or his representatives could actively explain the rationale, I would listen, but I've heard no such information. As for Obama, well the jury is still out and researching, which is why no endorsements have come through yet. If you have information on his voting record, I'd invite you to join me in a non-partisan and objective evaluation on where he stands on GREEK issues. Today the Greek Herald reported on a letter that Senator John McCain wrote to President George Bush urging him to support the Ecumenical Patriarchate in Turkey, to stand up for the human rights and religious freedoms of Orthodox Christians in Turkey, and to urge for the reopening of the Religious Schools in Halkis. I see in John McCain a man of good character who believes in the same ideals that Greece traditionally supports: democratic principles, religious freedoms, and respect for human dignity. If we do our part to put forth our message, which is CONSISTENT with AMERICAN ideals, we will accomplish so much with a McCain administration.